Forming a theater company is a bold move; ending a successful one is even bolder. A hat tip, then, to Scott Alan Evans, a founding member of TACT (The Actors Company Theatre) who, during the past quarter century, has produced and/or directed more than 150 productions for the company. Having declared the troupe’s artistic mission accomplished, Evans takes a final bow with an uneven production of a new work, Three Wise Guys, which he not only directs, but also co-wrote, with screenwriter and occasional lyricist Jeffrey Couchman. Muriel (Victoria Mack) receives unwanted attention from Heine (John Plumpis) in TACT’s final show, Three Wise Guys. Top, from left: Blondy (Karl Kenzler), Charlie (Ron McClary) and Dan (Jeffrey C. Hawkins) defy Prohibition. 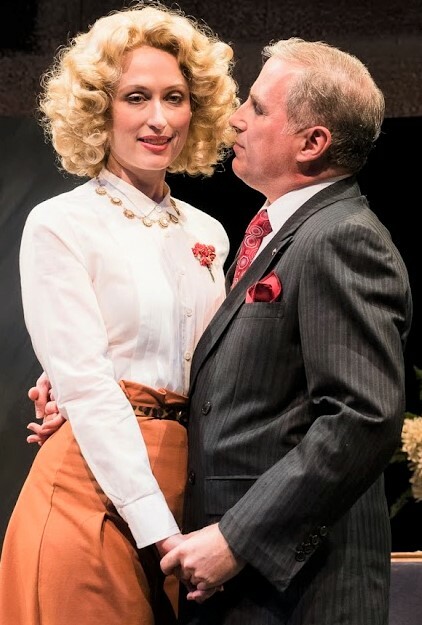 Actually, the play is primarily based on the work of a third writer, Damon Runyon. Evans and Couchman have taken two of the great short story writer’s pieces, “Dancing Dan’s Christmas” and “The Three Wise Guys,” and awkwardly combined them with their own contributions to create a Christmas Eve escapade where bumbling crooks take part in an extended game of hide-and-seek. While it is debatable whether this is the right time of year to mount a holiday comedy, there is no doubt that the setting is Runyon’s old New York, where Prohibition drives the underworld economy, guys and dolls speak of the past in present tense without use of contractions (“I am with him not so long ago”), and all the men have nicknames. The play opens with a good news, bad news scenario. The bad news is the dingy set, which at first is mostly hidden by large, ugly bedsheets hanging on a clothesline (on a December night, mind you). The good news is that the sheets are there to act as a screen for recurring bits of shadow puppetry, the first of which starts things off with an unexpected and welcome energy. A jewelry store robbery takes place with the shadows of stick puppets and live actors swirling in mayhem. Dan just might be connected to that shady jewel heist and needs to go into hiding. Luckily, the Dutchman happens to have a Santa suit that fits him. He dons the gay apparel just in time to avoid being spotted by racketeer Heine Schmitz (John Plumpis, pitch-perfect in his heinousness), then reasons that this would be a good time to skip town. The Dutchman offers to drive Dan to a hideaway in Pennsylvania, where he has business of his own, and Blondy tags along for no apparent reason. “If I stay here or take a ride, it is still the same old Christmas Eve,” he reasons. Hawkins as Dan with Ron McClary as the bartender Good Time Charlie. Photographs by Marielle Solan. Things do not go smoothly. Why? The butler did it. Yes, an English manservant (McClary again) takes the gang on a detour to Great Neck, Long Island, where they crash a ritzy party being thrown by Bitsy Albright (Dana Smith-Croll, channeling her inner Margaret Dumont). In a lengthy and mostly pointless scene, Dan steals a kiss from Muriel, his erstwhile girlfriend (an underutilized Victoria Mack). There’s a gag about a Persian carpet despite the stage floor being bare; Blondy puts on an elf hat; and Bitsy and Heine hit it off. With that list of holiday cheer taken care of, the three leads are on the road again to Pennsylvania. It is here that the title’s gag reveals itself, if the audience has not already guessed. The men follow a shining star to a barn, outside of Bethlehem. The Dutchman is seeking some stashed loot, but they also find Blondy’s old heartthrob, a very pregnant Clarabelle Cobb (Mack again, performing perhaps the quietest natural birth ever staged). Needless to say, her husband is named Joseph. 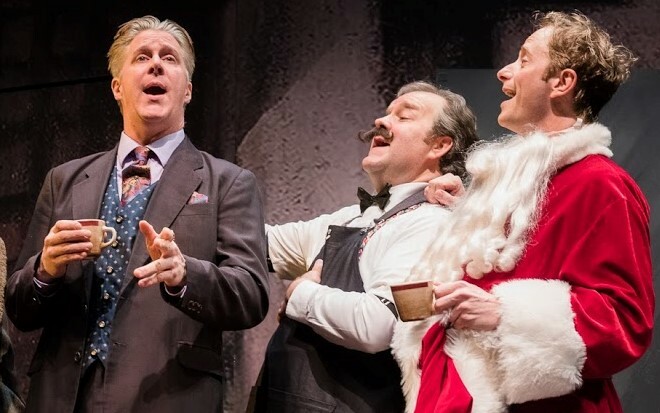 Three Wise Guys runs through April 14 at the Beckett Theatre, Theatre Row (410 West 42nd St.). Evening performances are at 8 p.m. Tuesday through Saturday; matinees are at 2 p.m. Saturday and 3 p.m. Sunday. Tickets start at $65, and are available by calling Telecharge at (212) 239-6200 or by visiting http://tactnyc.org/shows-events/three-wise-guys/.